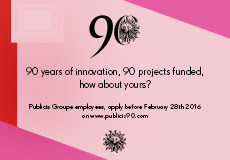 To celebrate 90 years of innovation, Publicis Groupe will provide 90 projects or start-ups with the support and funding they need to get off the ground. The 90 selected projects will receive between €10,000 and €500,000. Would you like to shorten the time to market for your innovative project? Are you a start-up in need of backing to grow? Whether you are a student, start-up founder, or just someone with a great idea, feel free to submit your project! Though eligible projects may concern any field of industry, they need to include digital technology. To participate in this call for project you just have to fill out the online form on www.publicis90.agorize.com. Describe your concept, its potential for development, the structure of your project… Feel free to discuss any points in greater detail!